Although we just got back from the EDOC 2011, we are already happy to announce another presentation. We are going to give a talk at the 4th international workshop on Social Data on the Web (SDoW2011) collocated with the International Semantic Web Conference (ISWC2011) in Bonn, Germany. This time, however, we are not going to focus on the Gi2MO project but on a spin-off announced earlier – a subproject called Marl. The talk is going to introduce the ontology for publishing and expressing opinions in form of metedata annotations on the Web. We are going to share the insights of the building process of the ontology and put most focus on the evaluation activities. The conference will take place during 23 – 27 October 2011 and the workshop will be held on 23rd of October. Check this post back after the conference for our presentation slides and the paper. For now, you might want to head over to the Marl project page to check out the details of the work. 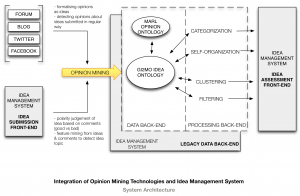 Optionally, take a look at our OPAL plugin that implements the use of opinion mining in practice, read our writeup on modelling opinions for Idea Management Systems or take a quick look at the diagram below that explains connection between modelling user opinions and Idea Management. 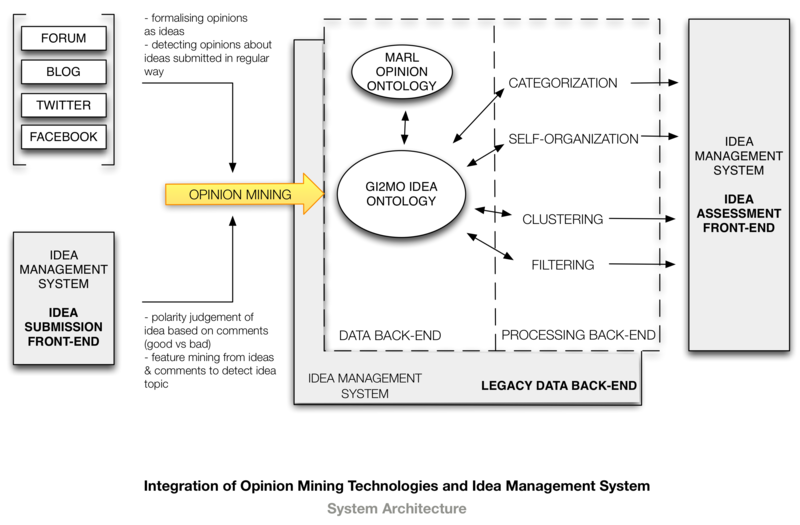 Modelling and processing user opinion metadata for Idea Management Systems.